The paintings of Sangram Majumdar, now on view simultaneously at Steven Harvey Fine Art Projects and around the corner at Projector, are paradoxical by nature. A self-proclaimed perceptual painter, many of the paintings read, at least initially, more abstract than representational. The paintings are seductive sensual and luscious, evincing a skill and sensitivity that few painters even get close to manifesting. At the same time they hold the viewer at a distance, raising more questions than they answer. While the paintings frustrate, complicate and undermine pictorial expectation, they also bring deep satisfaction in reflections, openings and bursts of revelation. 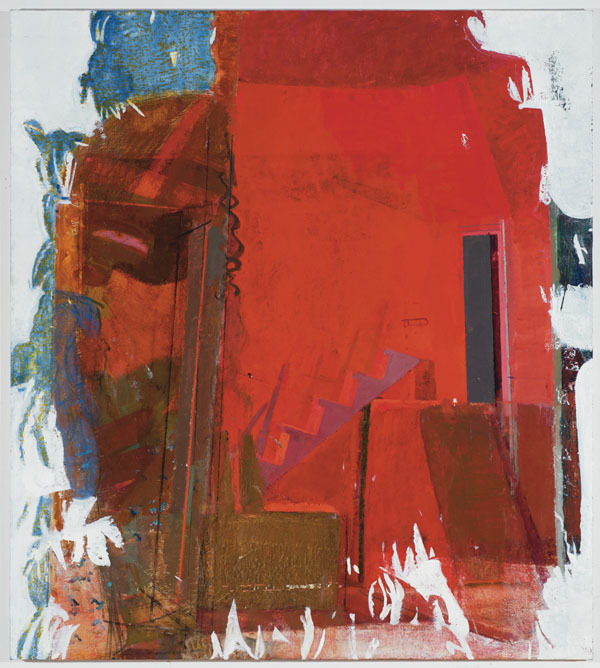 In eluding the obvious Majumdar often utilizes blockages, obfuscations and disruptions, in the process testing how far one can push perceptual painting and improvisation. The alternately fluid and dogged handling of paint recalls at times someone like Edwin Dickinson but with even more mystery and with the Academic tropes inverted. On the other hand, by highlighting unnamable qualities of the physical world he invites comparison to an abstract painter such as Thomas Nozkowski. The ambiguity with which Majumdar engages image making lets the paintings sit in between categories. His earlier paintings were more forthrightly depictive, but the artist seems to have realized that the more representational the paintings appear the more likely it is that what he is actually doing will be misunderstood. This new work is not easily categorizable, is not oriented towards simplistic interpretation or intellectualization, and is not oriented towards the production of interchangeable paintings. Each painting is a beautiful beast, both wild and cultivated, thoughtful and intuitive. 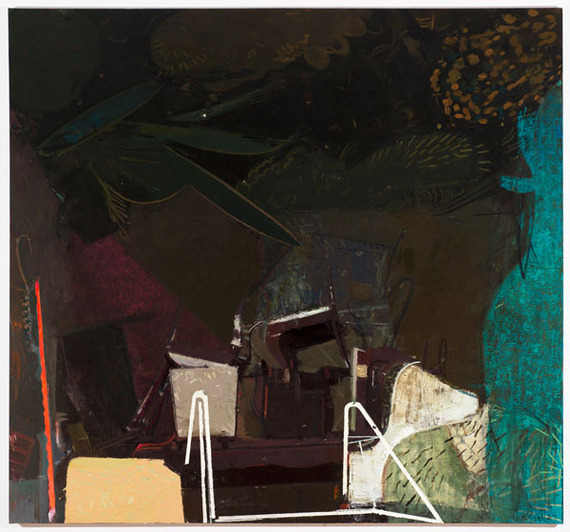 In an age when so much painting seems to be moving towards simplification, Majumdar asks us to accept the challenge of extended and thoughtful looking. 'Tilt' is an intriguing picture that recalls cubist tropes with its fractured planes and snippets of flat pattern. It is however an image based upon a postcard rack that the artist purchased on eBay. The images of the postcards, in earth tones against the magenta field of the painting, scatter out from the picture's central axis. They read as both flat shards spinning off the picture plane, and also as punctuations of pictorial space within the surrounding magenta opacity. The effect is a bit like a house of cards in mid-levitation rather than collapse. What reminds us of the implied hand of the magician, Majumdar's, are the scattered remnants of previous moves and decisions, since abandoned, that the artist allows to remain; these stand as reminders that what we see is not a pat trick, but the outcome of a hard-fought search for what is possible and true for this painting. 'Torque' is a prime example of the kind of visual ride that Majumdar provides for the viewer. 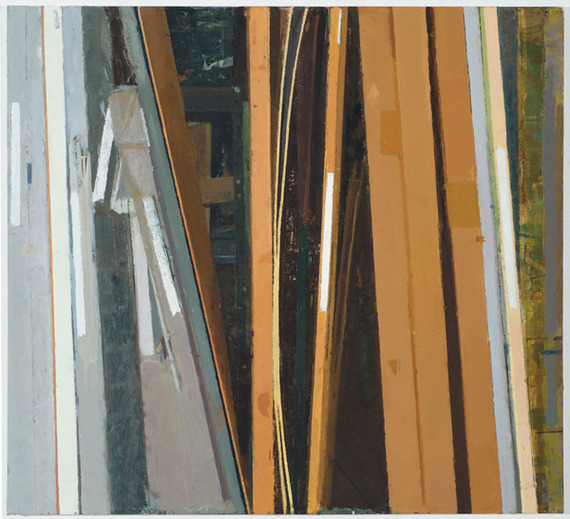 It is, at first look, one of the more naturalistic paintings in the show, depicting the side edges of paintings in a storage rack. This is a subject so banal in the life of a painter so as to pass notice as being worthy subject matter. The canvas is divided into a series of vertical and slightly diagonal bands as well as several long, slow and slim arcs, presumably of cardboard dividers. The lovely surprise is the way several of these bands recall the zips of a Barnett Newmann painting, hinting at the divine. In contrast, invoking the mundane, others of the bands must be looked at closely in order to determine that they are not in fact pieces of collaged on cardboard. In between the stacked paintings edges, the viewer can discern the hint of a deep space, which suggests a sense of mystery. In another twist, what Majumdar is choosing to represent, is both a physical presence, the sides of the canvases, and a tantalizing absence, for we are not privileged to see what lies on the surface of each of the paintings in the racks. Two more stand out paintings, 'Unbuilt to Suit' and 'Step Right Up', are among the largest canvases on view, which is when Majumdar is really at his best. Both pieces are based upon a dollhouse that the artists rescued from the trash, thus a small object is transformed into something other than it was via rescaling. This is not a simple Magrittean language game though. Majumdar has rearranged the dollhouse interior into a disconcerting nether space so that, for instance, in 'Unbuilt to Suit', a staircase is tantalizingly disconnected from a hovering and partially open doorway. A large crimson field, reminiscent in color of a massively expanded Rajhastani painting, anchors the entire painting. Around this red shape he has over painted a white border, a positive negative shape that has been drawn from the outer contour of another of the paintings in the show, 'Paper Tree'. In 'Step Right Up' a white piece of railing places the viewer at the bottom of the canvas as if climbing out of an abandoned swimming pool into a lush tropical forest. However, most of the flora forms in the top three fourths of the canvas are flattened in a way that reorients the point of view as if we are looking down topographically rather than up from the white ladder. With each of these paintings, the viewer is enveloped in their respective fields, one deep and dark, the other a luxuriant vermillion. Within these color ideas is an abundance of shifting tones and a plethora of ecstatic nuance that defies cogent description, which is part of the point. To a viewer unwilling to sit in the discomfort of not knowing, this may all seem like empty artistic gamesmanship. There is however profound pleasure to be had along the way of unraveling the 'what is it?' of each painting. The paintings are dynamic, vital elusive and unsettled, but not unsettling; rather they provide an extremely nourishing experience. And, it is clear, with close looking, that these paintings are built from the willingness to risk destroying everything in order to arrive at something new. With each move the artist invites failure, meeting the anxiety of potential dissolution with the realization of unexpected material substance. Maybe these paintings are too good. Elegance is unfashionable in an art world that seems to favor the off-hand. 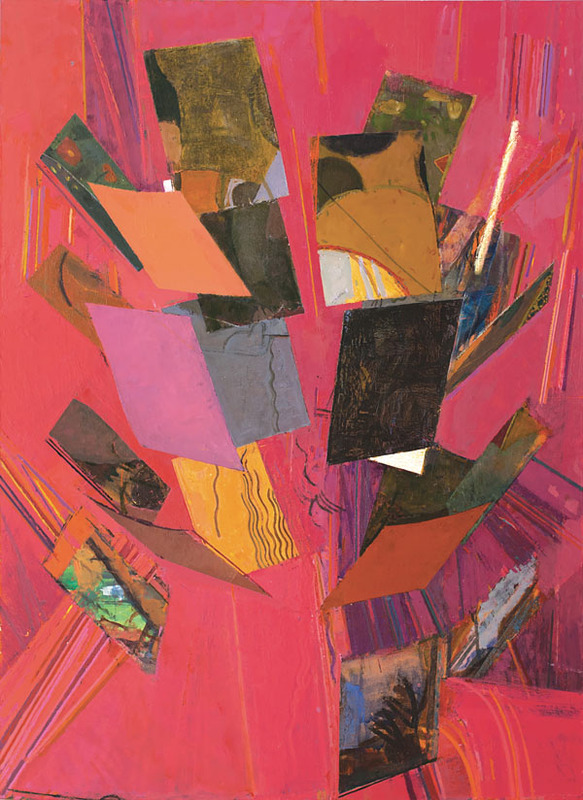 The rich color, density of paint and compositional inventiveness of Majumdar's work go against trends that favor the lazy and the formulaic on one hand or novelty and overweening newness on the other. Making something well, with skill and effort, and choosing not to settle on the easy and immediate solution, is not a posture for Majumdar though, but integral to who he is as an artist. Even in conversation with Majumdar about his work, I usually leave less sure about what he is thinking about than when the conversation began. But then, that is what keeps me coming back, for more looking. In the age of quick fixes and art made for maximum and immediate impact it is rare indeed to find an artist so willing to invite such prolonged viewing and so unwilling, despite the fact that the paintings are complete and whole, to tie everything up neatly in a bow for lazy and impatient minds. 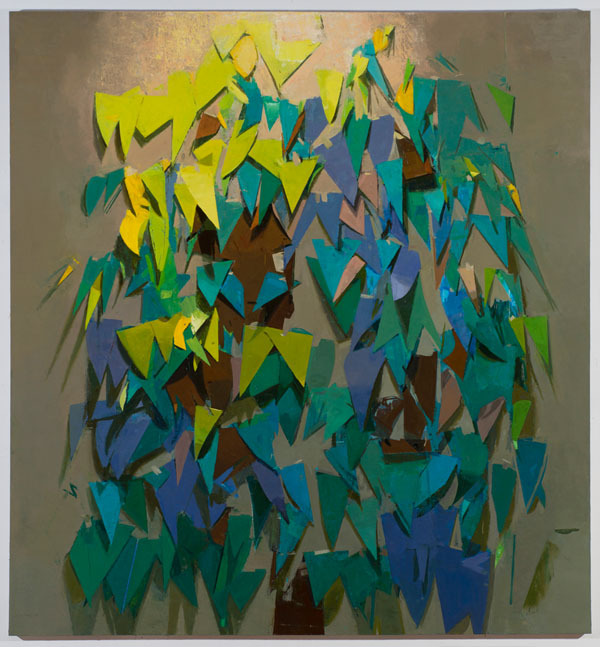 Sangram Majumdar- 'Peel' is on view at Steven Harvey Fine Art Projects 208 Forsyth Street, and Projector Gallery 237 Eldridge Street, New York, NY through Dec. 22nd, 2013. All images reproduced with permission and courtesy of the artist and Steven Harvey Fine Art Projects.